Advertisers who want to reach influential business people should consider local business publications a valuable resource. Because local business publications offer extensive reporting and exclusive content, they are regularly read by executives at the top of the company's organizational chart. These niche publications tend to have a large dedicated editorial staff, extensive print content, frequent Web updates and in-depth reporting, according to Jim Dowden, executive director of the Alliance of Area Business Publications (AABP). "For those readers in the region interested in local business news, the business-to-business title is a concentrated service," Dowden said. - 87 percent of readers are between the ages of 25 and 54. - 59 percent of readers have an annual household income of more than $100,000. - 71 percent of readers have a college or advanced degree. "When it comes to purchasing power, readers of business publications have access to the company purse strings," said Tim Bingaman, president and CEO of CVC. "Our readership studies show that nine out of 10 of these readers make purchasing decisions for their company." Further CVC readership information shows business readers are highly likely to purchase copier, fax and printing supplies (94 percent), computers (84 percent), cell phones and pagers (76 percent), accounting and financial services (72 percent) and computer and software support (70 percent). Many readers also indicated that in the next year they'd be purchasing copiers, fax machines and printers, office furniture, and professional services including financial planners and temporary employment services. 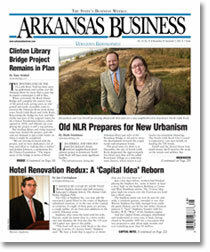 Like many business publications, Arkansas Business provides multiple opportunities for advertisers to tap these sought-after readers. In addition to traditional advertising in the weekly statewide business publication, advertisers can also buy space on the publication's Web site and their book of lists. "It's important to us to generate a very good Web site to keep readers up-to-date with news we can't cover on a weekly basis," said Chip Taulbee, associate publisher at Arkansas Business Publishing Group, which publishes Arkansas Business. Launched in 2000 to help the publication compete with other media, the site is wildly popular, registering 100,000 unique visitors each month. While business publication Web sites improve their timeliness and reach, books of lists give advertisers a year-long shelf-life. Focus lists, such as a list of the 75 largest private companies in the state, are exclusive to the local business publication, Taulbee noted. Each issue typically contains a focus list, and then all of those focus lists are compiled into an annual book of lists. "It's not uncommon to go into a CEO or executive's office and see a copy dog-eared and frayed on the desk," Taulbee said. With its year-long shelf-life, advertisers are pleased with their repetitive exposure in these books. Despite their smaller circulation sizes, when considering the number of businesses in the region, business publications tend to have some of the best penetration rates when it comes to reaching leaders, AABP's Dowden said. Advertisers are also pleased with the relationship readers have with their business publication. "The loyalty to business publications is incredible," Dowden said. AABP data show that more than 70 percent of readers have read the past four issues of the periodical. The typical reader spends about 40 minutes with each edition of Alliance publications. Market penetration, an influential and engaged readership, and quality content make business publications fertile ground for business-to-business advertising.